In cart shipping will be incorrect. Please call or email for shipping quote. These are completely sealed, absorbed glass mat, valve-regulated batteries with efficient recombination. UL Recognized components to UL MH17218. 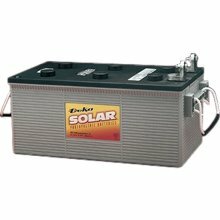 AGM batteries are recommended for battery backup standby power systems where batteries are in float service with occasional deep discharges. They can operate at temperatures from -40 to 140 F. Delivered from one of 20 MK warehouses across the U.S.